Page One of this solution was primarily about the use of an Almost Unique Rectangle in a chain. Page Two of this solution included some typical steps, plus a complex linking of several disparite types of Almost AICs. 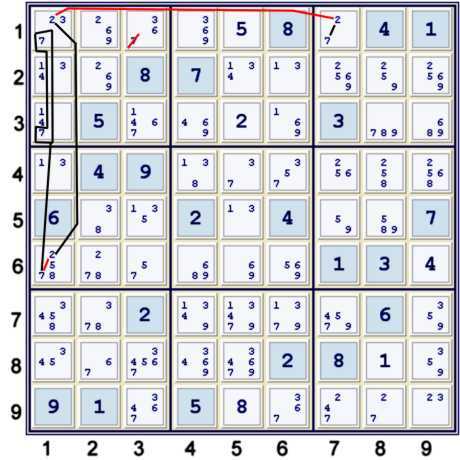 All of the Sudoku tips and tricks contained on this page are straightforward, albeit the last one perhaps less so. The difference between the two writings of this step given above are subtle. It is helpful to be aware of both. This is especially true if one employs counting with deeper, more complex chains or nets. Candidate 7 is ripe for a few easy eliminations. It happens with relative frequency that one elimination, such as the previous forbidding of (6) from r1c7, quickly leads to a host of eliminations using many similar or stacked strong inferences. By stacked, I mean that after making one elimination, another one follows easily. 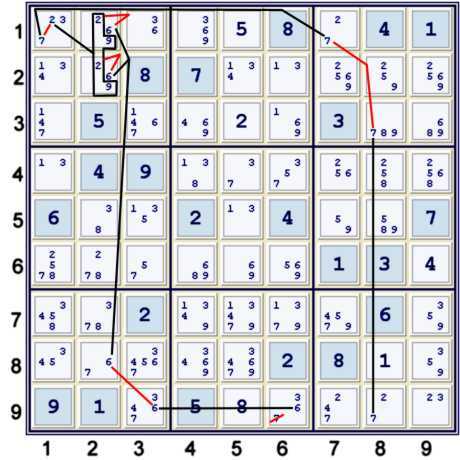 This puzzle seems to be ripe with Y Wing Style (YWS) type configurations. Even step 4d feels like a depth 3 YWS with the consideration of the Super Cell (8)r67c1. The only difference between the two chains should appear bold. When writing chains, I often prefer to use something similar to (HPxy-HPxz) as it maintains the symmetry of the Forbidding Chain or Alternating Inference Chain. Thus, the chain reads perfectly well in either direction. 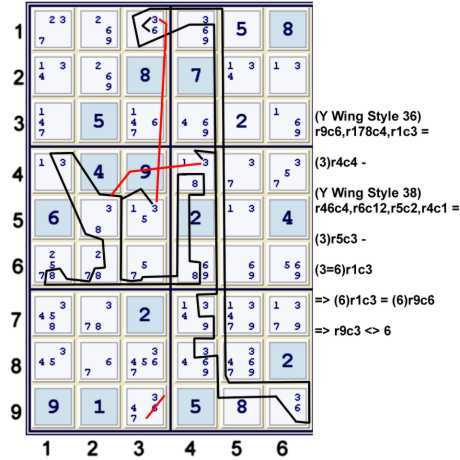 Below, the existence of the two disparite cells r9c6, r1c3 both limited to only (36) is a typical marker for one to look for a very common and easy to find type of Y Wing Style. This particular YWS almost exists, as graphed below. Where A is not an Almost anything, but rather a Y Wing Style that is either true or false. Thus A is prefectly symmetrical, logically, with (3)r4c4, which is also either true or false. Below, this Almost Y Wing Style is a bit harder to find. The previous AYWS indicates that one might benefit by looking for this one. B's existence (truth state) is linked to A at both ends of B. Below, the graphic may be messy, but the logic should be clear. 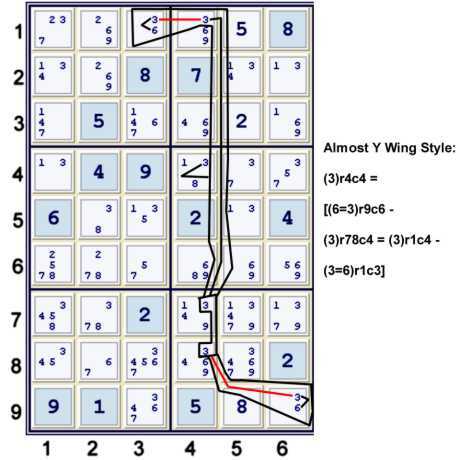 Interestingly, we thus have a Derived Y Wing Style that contains two native Y Wing Styles. I really enjoy such coincidences! One can start the counting anywhere. In this case, given (36) at r9c6 & r1c3, it makes perfect sense to investigate the count just as I did above. 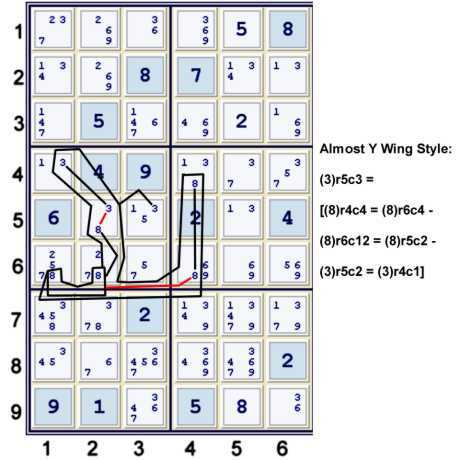 Note one could have tried placing (3) in the result column and looking at an Almost Y Wing style using perhaps (6)Box2. One can, by counting, find that r9c3≠3. However, that deduction is longer, more complex, and less powerful. This concludes the third page of this solution. Eventually, the link to the clean-up page will become active. Thanks, Steve. Very interesting!! Now for the studying part.